Utah beer from Upslope, a new look at Uinta and more. My desk has been piling up lately with news of brews, so I thought I'd sift through the clutter this week and share some of it with beer-loving City Weekly readers. Beer drinkers like me, who love our Uinta Brewing beers (UintaBrewing.com), will soon notice a significant change in the looks of Uinta's bottles and packaging. They've just released a new, snazzy logo which embraces the use of a compass. According to founder Will Hamill via a company press release, "the compass symbolizes our adventurous spirit, sense of direction in brewing and serves as a reminder to get out and get lost every once in awhile." Although to me the new logo looks quite contemporary, it's actually a vintage, WPA-influenced (Works Progress Administration) illustration style. Look for the updated design scheme—created in partnership with Nashville's Anderson Design Group—to be a part of all bottling and packaging by June. Boulder, Colo.-based Upslope Brewing (UpslopeBrewing.com) is becoming well-known for their "out-of-the-box" brews crafted using natural ingredients. One example is their recent collaboration with Fort Collins' New Belgium Brewing Co. to create a tropical stout that incorporates plantains with a rum-sugar glaze into the brew. Now Upslope Brewing has created a uniquely delicious Belgian-style blonde ale, brewed with guava, exclusively for the Utah beer-drinking market. "Upslope's heart is in the Rocky Mountains and Utah is smack dab in the middle of them," says Upslope's director of sale and marketing, Henry Wood, in a press release. "We couldn't ignore this beautiful border state, so we brewed a delicious session beer that conforms to the Utah state laws so we can be sold in grocery and convenience stores. We're looking forward to spreading the Upslope brand throughout the Beehive State." The Belgian-style blonde ale brewed with guava is 4 percent ABV (3.2 percent alcohol by weight) with aromas of crisp apples and Champagne. It's a bright, gently carbonated beer, both light-bodied and easy-drinking—a true session beer. Park City's Waldorf Astoria (WaldorfAstoriaParkCity.com) has partnered with Park City Brewery (ParkCityBrewery.com) to create their own exclusive beer, a rye pale ale named Pow Day. It's a crisp pale ale with hints of rye that pairs nicely with lighter summer dishes. It recently debuted at the first of the Waldorf Astoria's Bites N' Brews events—a monthly series showcasing locally crafted beers along with hors d'oeuvres created by Powder restaurant's executive chef, Ryker Brown. Upcoming dates for the series are June 9, July 14 and Aug. 11. Bites N' Brews tickets are $50 each and include two pints of beer, passed appetizers such as organic fried chicken and lamb belly, a 64-ounce glass growler and a coupon good for a free appetizer at Powder. I strongly recommend the crispy pork belly appetizer with onion, Swiss chard and apple cider reduction. Looking for a Father's Day gift for a beer-loving dad? 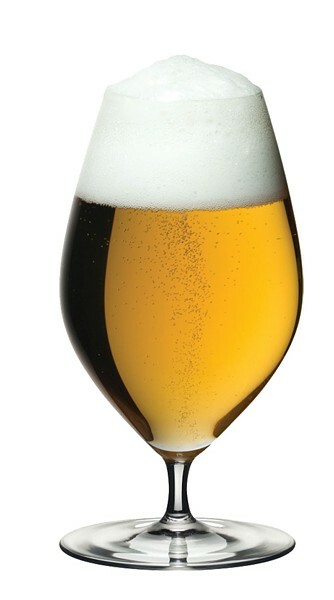 You might want to consider the all-new Riedel Veritas Beer Glass (RiedelUSA.net). The ultra-thin crystal allows brews to stay colder longer (because there's less glass to conduct heat), and the glass itself is designed to showcase beer's complex aromas, mouthfeel and flavors. The unique shape of the Veritas Beer Glass also doubles as a great glass for Albariño wine. Finally, for the seventh consecutive year, Squatters and Wasatch brewpubs, and the Utah Brewers Cooperative are teaming up to offer "Guilt-Free Desserts" during the month of May to benefit local charities. Hop on over to page 30 for more information.